Summer pick your own raspberries usually start soon after July 4′th. Season lasts about three weeks – because the berries ripen in stages we often are open for one or two days and then need to close for a day or two for more berries to ripen – check the web or FaceBook before you come to see that we will be open - remember, we are always closed on Mondays. 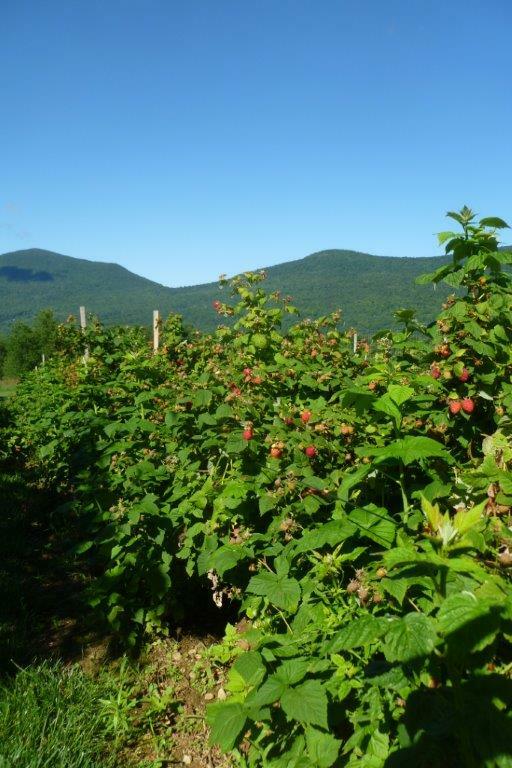 Because of the intermittent nature of picking for the raspberries, we are no longer putting signs up on RT 7 and relying instead on the website and FaceBook. I post frequently in the evening during the raspberry season. We no longer have Fall raspberries - the SWD (Spotted Wing Drosophila) fruit fly from Asia came to the United States a few years ago and has been moving further north each year – it reached us in 2013. The larva from the fly will show up in the berries in a few days after eggs are laid. It would require very frequent sprays to attempt to control the SWD, so we elected to get out of the fall berry business. Fortunately – the SWD comes later in the summer and is not a problem for summer raspberries.